In January of 1939, Jean Outram’s grocery shop in Cook Road, Hamilton Hill, was burgled, the padlock forced and vegetables stolen. In April, South Coogee poultry farmer M.H. Dadley’s prize Australorp, No. 67, laid a record 283 eggs in 336 days, every egg at first-grade quality. In May, Bibra Lake dried up completely for the first time in 25 years, leaving hundreds of fish dying on the muddy bottom and causing a terrible smell in the autumn heat. 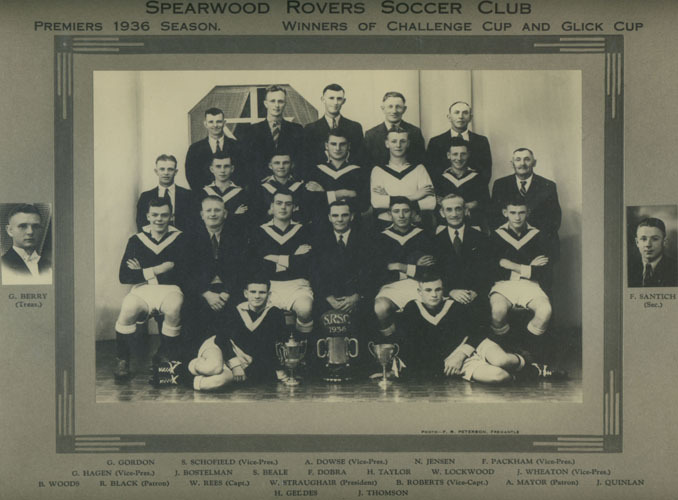 And in September, the Spearwood soccer team made it to the cup final, only to lose the trophy 4-2 to Victoria Park. eager as before to join up and do their part, were far from immune. Through the six long years they surrendered their sons and daughters to military service, their time to volunteer defence, and their work to the war effort. The district was still distinctly and comfortably rural, with its usual share of agricultural shows, train line troubles, and complaints about the state of the roads. To most of suburban Perth, the names Spearwood, Coogee, Bibra Lake and Jandakot still meant ‘farming’. Indeed, both Bibra Lake and Jandakot were still campaigning to be connected to electricity lines, residents living with kerosene lamps and coal fires. The major crops of the district were onions - so prevalent that the variety ‘Spearwood Brown Globes’ were known internationally - and potatoes, but gardeners grew everything from cauliflowers to string beans to pumpkins, all kinds of fruit and grapes, and there was a thriving poultry industry for eggs and breeders. In 1938, the district produced over £100,000 of fruit, vegetables, eggs, and poultry for the domestic market. In November 1939 the first of many military training camps took place near the abandoned Henderson Naval Base south of Woodman Point. The first troops into camp were the members of the peace-time 10th Light Horse brigade, a militia group left over from the First World War. Over the next months and years Naval Base saw thousands of men through its gates, undertaking basic training before being sent overseas. But even with troops drilling and men volunteering left, right, and centre, for most Cockburn inhabitants life went on much as it had done before. The terrifyingly efficient machinery of war roared and churned, but at a distance. Australia was a long way from the fighting in Europe, and her duty was to send men to the front to battle Hitler. The home shores, it was thought, were far from danger. Being a food-production district meant that Cockburn’s importance grew as the organisation of military affairs began to expand. Suddenly there were dozens of units of militia in training all over the state who needed feeding, not to mention the regular military, now the 2nd Australian Imperial Force (AIF), whose ranks were quickly swelling. But the higher demand for vegetables was met with a lower workforce, as more men joined the military or moved to the cities to take higher-paying jobs in munitions factories and other wartime industries. Many Cockburn growers could claim exemption from military service as workers in a protected industry, and workers in factories like Watsonia would be assured their positions for the length of the war. But often the sons or male employees of market gardeners were not exempt from service, and the loss of staff to the armed forces seriously endangered many Cockburn producers. Though the district’s work was essential, the introduction of necessities like rationing of petrol made it extremely difficult to remain competitive. At the beginning of the war Australia had only enough petrol to keep up normal motor supply for three months, and though the government tried to encourage the use of gas producers on their vehicles, the need for rationing became unavoidable, and it was announced in June 1940. Froude, L. ‘Petrol rationing in Australia during the Second World War’, Journal of the Australian War Memorial, Issue 36, May 2002. Many growers, particularly the smaller ones, were continually struggling to make ends meet when they could no longer even drive their produce to the Fremantle markets on the amount of petrol they were allowed each week, let alone run tractors or drive around their properties. Suggestions made to them, such as getting their produce taken to market by train or by cart, neglected to understand the precarious line walked by market gardeners in this dying era of the small metropolitan farmer. Trips to market were not only made to sell produce, which could only be handled and weighed accurately by the producers themselves, but also allowed for a return journey loaded up with necessities like fertiliser, manure, and equipment. How could the growers continue to supply civilians and soldiers with their food, Spearwood gardeners argued, when rationing of petrol was directly affecting the amount of food that could be produced? ‘Transport of vegetables’, West Australian, 4 Jul 1941, p.6; ‘Holding up supplies’, West Australian, 15 Nov 1943, p.4; ‘Market gardens: liquid fuel position’, West Australian, 12 Apr 1944, p.4. In June 1940, Italy entered the war on the German side, becoming an enemy of the Allied forces. Western Australia overzealously leapt to the defence of its citizens, quickly interning more than a quarter of the adult male Italian population as ‘enemy aliens’, regardless of their length of stay in Australia or their work as farmers, woodcutters, and food producers. All Italians in the Cockburn area had to register as enemy aliens, and their movements and work were heavily restricted. Many incurred fines for leaving their registration area to visit friends or family, driving vehicles without permits, or failing to sign up for civilian or military work forces.